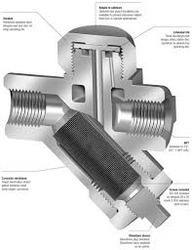 Exporter of a wide range of products which include steam traps & strainers. Traps and Strainers in carbon steel and alloy steel for high pressure services. Traps are available in TD-III type, Float Type etc. Strainers are also available in Y-type and T-type. All of these items give effecient service. Looking for Steam Traps and Strainers ?